Meet one of many new babies. A few people commented that they missed my old blog, which was more personal. I figured since this blog is not exactly bursting at the seams with readers who are tied only to ethical consumption (as far as I know), I'll just use this blog to write both personal and "of interest" things right here. I also have been finding it hard to divide content that seems to fit here, from content that would be better suited somewhere else, so it's naturally becoming more of a mishmash of things. (did I mention I welcome contributions? I will turn the comments section on so it's easier to get in touch with me.) So although I'll not to be extremely personal, as I've chosen to have my name linked to the blog, I'll also try to speak more about the kinds of things I've been learning/working on. I recently began a new job, working for a government agency and continuing to work on refugee issues in Boston. It's exciting and wonderful for me. I believe that refugees may be uniquely suited to understanding many of the trends we see globally. Refugees are uniquely able to be bi or tricultural. This, with the qualification that most refugees have been through really difficult events. But, as after WWII, refugees may be able to be the visionaries who see societies and communities from the inside AND from the outside, simultaneously. I've always been struck by the gallery of Prominent Refugees, found on the UNHCR homepage. I past one extract from that resource, below. 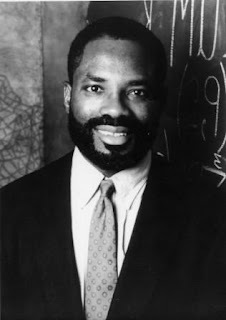 A "father of the Internet", sometimes called the Bill Gates of Africa, computing superbrain Philip Emeagwali spent years of his childhood in a refugee camp before he went on to become, in former US President Bill Clinton's words, "one of the great minds of the Information Age". Emeagwali grew up in Onitsha, in south-eastern Nigeria, one of nine children of Ibo-speaking parents. He showed early promise at school, even though he often had to work to help support his family. He was nicknamed "Calculus" by classmates for his extraordinary abilities in maths. His father, a nurse, would quiz him with 100 maths problems and leave him only an hour to find all the solutions. By the time Emeagwali entered fifth grade, his teacher would let him take over the class when he was absent. In 1966, fighting erupted between the central government and the ethnic Ibo population. In the Biafran civil war that followed, the south-eastern region attempted to secede from Nigeria, and Emeagwali spent most of the period from 1967 to 1970 in a refugee camp. The Nigerian government restricted food importation to Biafra, starving nearly one million refugees to death. In 1974, Emeagwali went to the United States on a scholarship with $140 in his pocket. Fifteen years later, he graduated in mathematics, civil, coastal and marine engineering and computer science. In 1989, he won the computing world's Nobel Prize, the Gordon Bell Prize, for solving a problem that had been classified by the US government as one of the 20 most difficult computing problems ever. Using 65,000 processors, he was able to perform the world's fastest computation at 3.1 billion calculations per second. His invention is widely used in programming and building the world's most powerful supercomputers and has also been used to maximise petroleum extraction. Emeagwali has been living in the US since 1974 and underlines the huge contribution that immigrants have made to America. "Third World countries are giving technological aid to the United States that is worth about 12 billion dollars a year. One in 20 Americans was born abroad. Two thousand Nigerian doctors practice in the United States. There are more Sierra Leonean doctors in Chicago than in Sierra Leone," he says. At his own website, emeagwali.com, he welcomes browsers to "the first personal website on the Internet." He has helped promote Africa ONE, a project to loop the entire African continent with 30,000 km of fibre-optic cable lines so that phone calls from one African country to another will not have to pass through Europe. When Emeagwali was asked what qualities he would like to pass on to his son, he replied, "I want him to be inspired by the fact that I was a high school dropout and an ex-refugee who overcame racism and made scientific contributions that benefited mankind." We've been trying to grow plants from seed this year, and right now we have a set of really tiny tomato plants (2 different species), a couple of tiny bell peppers, and some rosemary. The Rosemary is excellent because potentially it'll be around for years to come. We decided to buy and Early Girl Tomato seedling so that we could start our tomatoes early, and we also bought 2 strawberry plants, which are productive for 2 to 3 years. So far this season we've spent US$50 on seeds, soil, and seedlings. We used gift cards for most of this amount. And this cost includes a blueberry plant that we've given to my mom-in-law. I'm trying to keep track of money spent on the garden so that we really know what having a garden means financially. I hope to post pictures mid-week. Please stay tuned! These are some (disjointed) ways we're making our lives simpler in the context of life here in Boston. Some are big, some are small, and some might not make sense given your life circumstances. Small adjustments can translate into a lower-environmental impact life, and a sustainable set of habits where we don't feel deprived, either. 1) Investing in a chest freezer. It's much easier to eat at home when the basics are already in the freezer. And it's much easier to cook for several meals. Because it's not always clear how much we'll eat in the space of time it takes for vegetables to go off, we can also keep some frozen vegetables, pasta sauce, etc. Ours cost $100 second-hand. 2) No TV. I'm not sure we watch less, but watching shows/movies is a choice because we get the DVDs from the library. We also have more space. 3) Growing as much as you possibly can every spring and summer, even if you're in an apartment and it's a freezing climate. I'm going to try to keep track of the cost of this. We're growing primarily from seed this year. Growing your own food means you don't have to consider whether something's local, in season, or organic. It just is. It's also a good way to eat a wide variety of vegetables. 4) Investing in a bread maker (if you don't have time to make your own bread from scratch). It really helps to know what goes into what we eat: bread in regular supermarkets can be either very expensive or very filled with strange substances. We also make our own pizza at least once a week. The cost of a loaf of really good bread is reduced exponentially as the bread maker gradually pays for itself. In our case, the bread maker was a gift. 5) Even though I'm reading a lot these days, I've stopped buying books altogether.. But books were a source of clutter and expense for me-- The libraries in Boston are generally amazing. If I'm tempted, I order the book through the library network. 6) Living in a small place. Its pretty obvious when we have too much stuff, which is helpful. We do have a huge cupboard though, which is also helpful. 7) Eating breakfast. I don't try to keep it super-healthy, I'm still at the point where just making sure I eat something is a good enough step. 8) Weighing in every morning. Sounds weird, but it's much easier to see a trend and make small adjustments if necessary. The aim is just to avoid getting in a rut that's hard to see the way out of. It actually makes me far more able to eat what I like. 9) Knowing our finances. For a while, I wasn't sure how to understand our financial state, and as a result I was just trying to infinitely cut costs. It's really helped to know where we stand so that I can feel safe and make good decisions about whether/when to buy what. For example, if I know we've had a good month financially, I feel pretty comfortable buying more expensive vegetables, or even more able to be generous. It really helps to have a plan, so that reducing your environmental impact and reaching your financial goals (getting out of debt, giving away a larger percentage of your income, etc) don't seem at odds with one another. 10) Taking my own travelling mug/nalgene everywhere. I'm hoping to do this 100% of the time by the end of this month. I wrote this because I am starting a new job this coming week, and wanted to look back in preparation. My new job is in Refugee and Immigrant Health, but not specifically with Somalis. I wanted to thank my coworkers and those who helped me to get involved at the organizations I've been involved in. I learned very much from you. I've been told that one can learn by "hanging around," and my own experience agrees. I owe much of my personal and professional growth to the Somali community in Boston, where I've been hanging around since 2001. I've measured the years by the events in the community—Somali National weeks, the end of bilingual education in Massachusetts, the arrival of Somali Bantus to the state, Somali women's nights, weddings and births. Somali-American perspectives became my lens: on the impact of colonialism and civil war, on the ways history is lived out, on being a "new American", and on being a refugee. The reality of my own growth does not diminish the pain of the civil war that sit at the foundation of the very existence of a Somali "community" in Boston. My knowledge of Somalia was very limited when I first met Somali children in West Roxbury, Boston. Like many sub-Saharan Africans (and particularly white ones), I didn't know where Northeast Africa fitted in the history of the continent. Why do Northeast Africans look different? Are they still African? Were they colonized too? What did it mean for Africans to be Muslim? I was eighteen, idealistic and excited about what was before me in the United States, and quickly volunteered to tutor Somali youth in a bilingual program. It was a way to get off campus once or twice a week, and stay connected to Africa. But it was an Africa I had never been exposed to before. I began to discover that there are many Africas. My experience as an African didn't bring with it much advantage for understanding other parts of the continent. My learning began soon after 9/11/2001, and so I caught glimpses of the prejudice that had resulted from 9/11, through the experiences of Somali middle-schoolers. Schoolmates targeted Somali girls particularly—who were usually wearing the hijaab—with taunts and racial slurs. The relevant questions in response were obvious: Why should refugee children, some right out of Dadaab camp, be associated with extremist bombers? Is the hiijaab inevitably a controversial statement? Just two years later, Governor Mitt Romney signed away bilingual education. Somali children would now be immersed in English. Yet some Somali children weren't just struggling with English. They couldn't sit still because they hadn't been to school before age ten. They were living with families that were not their own. Being a refugee didn't only mean first-hand experience of violence. It meant missed educational opportunities, divided family, convoluted identity, and often, difficult adjustment. A student once revealed that she wore a headscarf at school only, by her parent's directive, so that she didn't seem irreligious to the other students' parents. Another student said the same thing. These 10-year-olds abided by their parent's decision even when it resulted in significant prejudice against her. By the time the after-school program faded with the end of the school bilingual program, I had insights as to what it meant to be a "new American". I also had an abiding interest in Northeast Africa. I had begun to work at the Refugee and Immigrant Assistance Center, a Somali-run community-based organization. I have been involved in this organization for over five years (a long time for a 24-year old). It's clear that being Somali in 2008 is not always exotic or beautiful. The community can be suffocating or supportive. Not all Somali young people are doing well. I'm not certain that Somalis in Boston are doing better than they were a few years ago. But the Somali organization I work for is certainly much more deeply connected to other "new American" communities than it was in 2003. And if community members are able to reach out to those beyond their horizons, surely they will be able to negotiate more consciously between their Somali and American worlds. After studying African history, I went on to study Forced Migration in South Africa, and Public Health in Boston. I believe this path was largely because I found an accepting space in the Somali community. This space was the end of white South African guilt, because I knew if I could contribute to one community, I could contribute as an African. Maybe I can even reach out beyond my community and negotiate more consciously between my own South African and American worlds. 3 tomato babies emerged this week, although there were still times when the temp went below freezing (I think). Also, 3 lavender, and there's evidence that a bell pepper seed is seriously considering life.